Background: Grading and hormone receptor determination in breast carcinoma are predictive factors for response to hormonal therapy. Aim: This study was undertaken to grade breast carcinoma and to determine estrogen receptor (ER) and progesterone receptor (PR) expression on fine-needle aspiration cytology (FNAC). Furthermore, the objective was to compare the results with histological grading and immunohistochemistry on surgical material. Materials and Methods: Fifty cases of breast carcinoma diagnosed on FNAC were included. The cytological grading was done according to the Robinson's grading system. The corresponding histology sections were graded using the modified Bloom-Richardson system. Immunostaining for ER and PR was done on smears and tissue sections. Results: On both cytological and histological evaluation, 49 cases were infiltrating ductal carcinoma and one case was colloid carcinoma. On comparing cytological and histological grading, 78% were correctly graded on cytology. The sensitivity, specificity, positive predictive value and negative predictive value for ER detection on immunocytochemistry (ICC) were 55.6%, 95%, 93.8% and 61.3%, respectively. The sensitivity, specificity, positive and negative predictive value for PR detection on ICC were 57.7%, 95.2%, 93.8% and 64.5%, respectively. The correlation for ER and PR between cytology and histology was 72.3% and 74.5%. Conclusion: The grading along with ER and PR immunostaining of breast carcinoma on smears is advocated because of high concordance between cytology and histology. This allows the patient to be treated with hormonal therapy on the basis of FNAC alone. The major prognostic factors for breast carcinoma include histological type, grading, axillary lymph node status, lymphatic and vascular invasion, hormone receptor status and surface epithelial growth-factor receptors. Still others are DNA ploidy, human epidermal growth factor-2 (HER-2) oncogene, cathepsin-D, angiogenesis and mutant p53 expression. However, none of these is shown to have an independent significance as a single prognostic marker. The prognostic and therapeutic implications of estrogen receptor (ER) and progesterone receptor (PR) in breast cancer have been studied extensively. Up to 75% of primary breast carcinomas express ER, about 50% co-express PR and about 20% have no ER or PR expression. Hormone receptor determination acts primarily as a predictive factor for response to therapeutic and adjuvant hormonal therapy. The presence of ER is related to a favorable response to tamoxifen therapy and improved overall survival. The aim of this study was to grade breast cancer on FNAC and correlate with histological grading and further, to determine the ER and PR expression on immunocytochemistry (ICC) on smears and compare the results with immunohistochemistry (IHC) on surgical material, in order to establish the degree of cytohistologic correlation. The present prospective study was conducted on 50 primary breast carcinoma cases diagnosed on FNAC. Only those cases, who had not received prior radiotherapy or neo-adjuvant chemotherapy, were included. Patients who had undergone prior biopsy and pregnant patients were excluded from the study. The histopathology tissue in the form of core-biopsy, lumpectomy or mastectomy was studied in all the cases. The study protocol was approved by the Institute ethics committee and informed consent was obtained from all patients. Fine-needle aspiration was performed by the standard technique using a 22-23G needle attached to a 10 mL syringe fitted onto a Franzen's handle. One or two passes were taken to obtain adequate material and 5-7 slides were prepared. Both wet and air-dried smears were made and stained with May-Grünwald-Giemsa, Hematoxylin and Eosin (H and E) and Papanicolaou stains. Tumor typing and grading was done into three-tier system of Grade I, II and III according to the Robinson's cytological grading. Mastectomy was done in 36 (72%), core-biopsy in 8 (16%) and lumpectomy in 6 (12%) cases. The paraffin embedded and formalin fixed sections were stained by routine H and E staining. The sections were studied for the tumor type and grading using the Nottingham modification of Bloom-Richardson system of grading. Estrogen receptor and PR IHC was performed on 3 micron thick sections cut from the formalin fixed paraffin embedded tissue. For ICC, the air-dried smears were fixed in equal amounts of methanol and ethyl alcohol for 20 min. Antigen retrieval was done in citrate buffer at pH 9 in the microwave for 6-8 min and slides were washed with Tris buffer. Endogenous peroxidase was blocked with 0.3% hydrogen peroxide in distilled water for 20 min, followed by rinsing in buffer. Smears and sections were incubated with primary ER/PR antibody (DAKO, Denmark) for 1 h, rinsed in buffer and incubated with streptavidin-peroxidase detection system (DAKO real envision) after applying the secondary antibody. The slides were washed with Tris buffer, and chromogen diaminobenzidine (DAKO) was applied for 5-7 min. After washing with water, counterstaining with hematoxylin was done. The positive controls consisted of smears/sections of fibroadenoma. The negative control was a smear/section where the primary antibody was omitted and substituted with buffer. Cases with nuclear positivity in more than 10% of the tumor cells were taken as positive. The smears and the histopathology tissue sections were evaluated separately. All the 50 patients were females and the age ranged from 27 to 78 years with a mean of 52.08 ± 12.6 years. Maximum number of patients, 16 (32%) were in the 5 th decade of life. Forty nine (98%) were multipara while 1 (2%) was a nullipara. Twelve (24%) were premenopausal, whereas 38 (76%) were postmenopausal. All the patients presented with a common complaint of palpable breast lump, which was single and unilateral in all the cases. The duration of lump varied from 15 days to 18 months with a mean of 6.1 months. On cytological evaluation, 49 (98%) tumors were categorized as infiltrating ductal carcinoma (IDC) and 1 (2%) as colloid carcinoma. Of 49 cases of IDC; 6 (12.2%) were Grade I, 31 (63.3%) were Grade II whereas 12 (24.5%) were Grade III tumors. One case of colloid carcinoma was put in Grade I category. On immunostaining, 17 (34%) cases were both ER and PR positive, 33 (66%) were both ER and PR negative. In 42 cases of lumpectomy and mastectomy specimens, the tumor size was <2 cm (pT1) in 1 (2.4%), between 2 cm and 5 cm (pT2) in 33 (78.6%) and >5 cm in 8 (19%) cases. The most frequent histological subtype was IDC (not otherwise specified) in 49 (98%) cases, of which 2 showed areas with mucinous change. One (2%) case was of colloid carcinoma. Of 49 cases of IDC; 10 (20.4%) were Grade I, 32 (65.3%) were Grade II, and 7 (14.3%) were Grade III. One case of colloid carcinoma was Grade I.
Estrogen receptor and PR immunostaining could be assessed in 47 of 50 cases. In one case the tiny core-biopsy was consumed during processing while in 2 cases the tissue section floated during immunostaining even after repeated efforts. Out of 47 cases; 27 (57.4%) were ER positive, 26 (55.3%) were PR positive and both ER and PR were positive in 25 (53.2%) cases. On correlation of grading with IHC, 9 of 11 (81.8%) Grade I tumors and 16 of 32 (50%) Grade II tumors [Figure 1] were positive for both ER and PR. All Grade III tumors and 12 (37.5%) Grade II tumors were negative for both ER and PR. On comparing cytological and histological grading, 39/50 (78%) cases were correctly graded on cytology. The concordance rate was 7/7 (100%) for Grade III tumors, 26/32 (81.3%) for Grade II and 6/11 (54.5%) for Grade I tumors. Six cases with histologic Grade II were discordant of which five were reported as Grade III and one as Grade I on cytology. All the five discordant Grade I cases were reported as Grade II on cytology [Table 1]. The overall concordance rate between grading on cytology and histology was moderate with a kappa value (overall agreement relative to expected agreement by chance alone) of 0.59. Estrogen receptor and PR status was assessed on both the aspirate smears and histological sections. The results were concordant in 33 (70.2%) cases and discordant in 14 (29.8%) cases as shown in [Table 2]. Of 25 cases showing both ER and PR positivity on IHC, 15 cases were positive for both the receptors on ICC. Of 19 ER and PR negative cases on IHC, 1 case was positive for ER and PR on ICC. The correlation between cytology and histology for ER and PR was 72.3% and 74.5%, respectively. The concordance rate between ICC and IHC was moderate with a kappa value of 0.47 and 0.50 for ER and PR, respectively. The patients of breast cancer are subjected to FNA as a part of the triple assessment before proceeding on with any form of treatment. Moreover, in the developing countries FNA is in fact the most common preliminary procedure in cases of palpable breast lumps. To decide on the best possible neo-adjuvant chemotherapy or hormonal therapy, knowledge about steroid receptor status is a must. Therefore, most of these cases undergo a second biopsy for the sole purpose of IHC. This practice in itself has many disadvantages in that it exposes the patient to a second invasive procedure, with an extra cost involved in the proceedings and the theoretical risk of micro-metastasis. Although several markers have been used to identify specific prognostic groups and predict response to treatment, histological grade still remains one of the best predictors of tumor behavior. The assignment of histological grade to all the breast cancers has therefore been recommended as a standard in all surgical pathology reports. Since in most cases, FNAC is a source of primary diagnosis and many treatment options are made preoperatively based on this, as much prognostic information should be gained from the cytological material as possible. In the current study, 78% cases of carcinoma breast were correctly graded on cytology. Variable concordance ranging from 64% to 89.1% has been reported by previous studies in the literature. ,,,, In the present study, concordance rate was maximum for Grade III tumors (100%) and minimum for Grade I tumors (54.5%). In all the discordant cases, the cytological grade was next lower or higher grade. Not a single case had miscorrelation of more than one grade. The reason for the discordance may include lack of tubules and mitosis as criterion for grading in the aspirated material, which are important histological features. Although IHC for ER and PR on sections/cell blocks is considered better than ICC on cytology smears, a satisfactory correlation was seen between the two in the present study. The concordance of ER and PR on IHC and ICC was 72.34% and 74.46%, respectively. Variable concordance of ER/PR on aspirate smears versus histopathology sections ranging from 50% to 98% for ER and 29% to 95% for PR has been observed in different studies. ,,,,,, ER expression was found to be false negative on aspirates in 12 cases while 1 case was positive on smear where IHC failed to demonstrate the positivity. Eleven cases showed false negativity for PR expression on smears while 1 case was positive on ICC which was negative on IHC. In the current study cases with nuclear positivity for ER/PR antibody in more than 10% of the tumor cells were taken as positive. The ER/PR receptor expression is undoubtedly a prerequisite to plan effective clinical management in breast cancer patients. FNA material can also be used for evaluation of HER-2/neu status. Patients with HER-2/neu overexpression are likely to benefit from chemotherapy, hormone therapy and immunotherapy. However, HER-2/neu staining was not a part of current study. To conclude, the present study demonstrates the usefulness of grading breast carcinoma on aspirate smears. The hormone receptor status can be studied on cytology smears and the patients can be treated with hormonal therapy on the basis of FNAC, thus a surgical procedure can be avoided in a good number of cases. Lester SC. The breast. In: Kumar V, Abbas AK, Fausto N, Aster JC, editors. Robbins and Cotran Pathologic Basis of Disease. 8 th ed. Pennsylvania: Saunders; 2010. p. 1065-97. Ellis IO, Galea M, Broughton N, Locker A, Blamey RW, Elston CW. Pathological prognostic factors in breast cancer. II. Histological type. Relationship with survival in a large study with long-term follow-up. Histopathology 1992;20:479-89. Wani FA, Bhardwaj S, Kumar D, Katoch P. Cytological grading of breast cancers and comparative evaluation of two grading systems. J Cytol 2010;27:55-8. Lingegowda JB, MuddeGowda PH, Ramakantha CK, Chandrasekar HR. Cytohistological correlation of grading in breast carcinoma. Diagn Cytopathol 2011;39:251-7. Bhargava V, Jain M, Agarwal K, Thomas S, Singh S. Critical appraisal of cytological nuclear grading in carcinoma of the breast and its correlation with ER/PR expression. J Cytol 2009;25:58-61. Hanley KZ, Birdsong GG, Cohen C, Siddiqui MT. Immunohistochemical detection of estrogen receptor, progesterone receptor, and human epidermal growth factor receptor 2 expression in breast carcinomas: Comparison on cell block, needle-core, and tissue block preparations. Cancer 2009;117:279-88. Railo M, Nordling S, Krogerus L, Sioris T, von Smitten K. Preoperative assessment of proliferative activity and hormonal receptor status in carcinoma of the breast: A comparison of needle aspiration and needle-core biopsies to the surgical specimen. Diagn Cytopathol 1996;15:205-10. Pandit AA, Parekh HJ. Cytologic grading of breast carcinoma: Comparison of four grading systems. J Cytol 2000;17:39-44. Jayaram G, Elsayed EM. Cytologic evaluation of prognostic markers in breast carcinoma. Acta Cytol 2005;49:605-10. 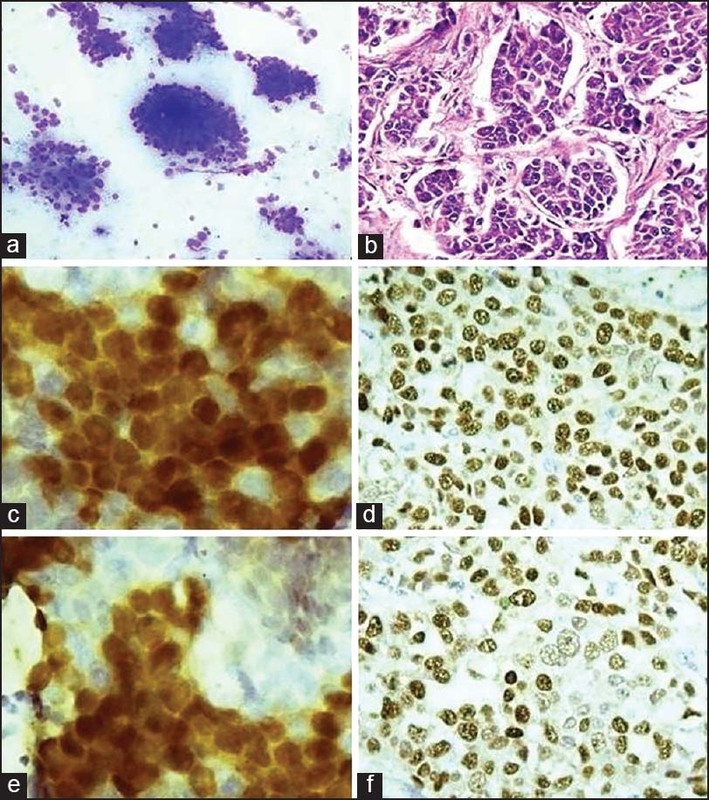 Khan MZ, Haleem A, Al Hassani H, Kfoury H. Cytopathological grading, as a predictor of histopathological grade, in ductal carcinoma (NOS) of breast, on air-dried Diff-Quik smears. Diagn Cytopathol 2003;29:185-93. Desai SB, Moonim MT, Gill AK, Punia RS, Naresh KN, Chinoy RF. Hormone receptor status of breast cancer in India: A study of 798 tumours. Breast 2000;9:267-70. Shet T, Agrawal A, Nadkarni M, Palkar M, Havaldar R, Parmar V, et al. Hormone receptors over the last 8 years in a cancer referral center in India: What was and what is? Indian J Pathol Microbiol 2009;52:171-4. Chariyalertsak S, Chariyalertsak S, Ruangvejvorachi P. Immunohistochemical detection of estrogen and progesterone receptors in primary breast cancer. Asian Pac J Allergy Immunol 1998;16:161-6. Allred DC, Harvey JM, Berardo M, Clark GM. Prognostic and predictive factors in breast cancer by immunohistochemical analysis. Mod Pathol 1998;11:155-68. Rhodes A, Jasani B, Balaton AJ, Barnes DM, Miller KD. Frequency of oestrogen and progesterone receptor positivity by immunohistochemical analysis in 7016 breast carcinomas: Correlation with patient age, assay sensitivity, threshold value, and mammographic screening. J Clin Pathol 2000;53:688-96. Lal P, Tan LK, Chen B. Correlation of HER-2 status with estrogen and progesterone receptors and histologic features in 3,655 invasive breast carcinomas. Am J Clin Pathol 2005;123:541-6. Ayadi L, Khabir A, Amouri H, Karray S, Dammak A, Guermazi M, et al. Correlation of HER-2 over-expression with clinico-pathological parameters in Tunisian breast carcinoma. World J Surg Oncol 2008;6:112. Almasri NM, Al Hamad M. Immunohistochemical evaluation of human epidermal growth factor receptor 2 and estrogen and progesterone receptors in breast carcinoma in Jordan. Breast Cancer Res 2005;7:R598-604. Marrazzo A, Taormina P, Leonardi P, Lupo F, Filosto S. Immunocytochemical determination of estrogen and progesterone receptors on 219 fine-needle aspirates of breast cancer. A prospective study. Anticancer Res 1995;15:521-6. Briffod M, Hacène K, Le Doussal V. Immunohistochemistry on cell blocks from fine-needle cytopunctures of primary breast carcinomas and lymph node metastases. Mod Pathol 2000;13:841-50. Zoppi JA, Rotundo AV, Sundblad AS. Correlation of immunocytochemical and immunohistochemical determination of estrogen and progesterone receptors in breast cancer. Acta Cytol 2002;46:337-40. Moriki T, Takahashi T, Ueta S, Mitani M, Ichien M. Hormone receptor status and HER2/neu overexpression determined by automated immunostainer on routinely fixed cytologic specimens from breast carcinoma: Correlation with histologic sections determinations and diagnostic pitfalls. Diagn Cytopathol 2004;30:251-6. Malaviya AA, Chinoy RF, Prabhudesai NM, Sawant MH, Parmar V, Badwe RA, et al. Immunocytochemistry on scrape cytology in breast cancer: Will it unearth the weaker positives? Acta Cytol 2006;50:284-90. Radhika K, Prayaga AK. 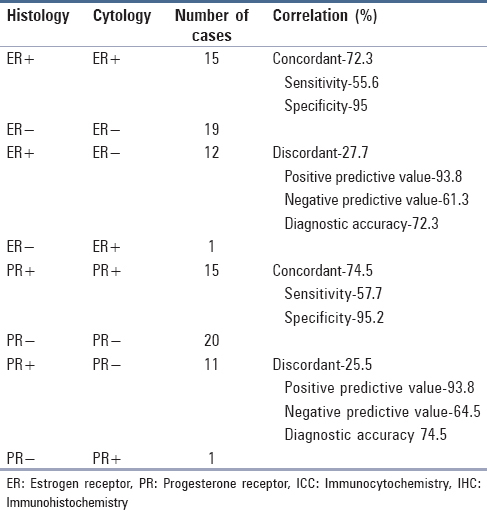 Estrogen and progesterone hormone receptor status in breast carcinoma: Comparison of immunocytochemistry and immunohistochemistry. Indian J Cancer 2010;47:148-50. Pegolo E, Machin P, Riosa F, Bassini A, Deroma L, Di Loreto C. Hormone receptor and human epidermal growth factor receptor 2 status evaluation on ThinPrep specimens from breast carcinoma: Correlation with histologic sections determination. Cancer Cytopathol 2012;120:196-205. Gong Y, Symmans WF, Krishnamurthy S, Patel S, Sneige N. Optimal fixation conditions for immunocytochemical analysis of estrogen receptor in cytologic specimens of breast carcinoma. Cancer 2004;102:34-40. Rhodes A, Jasani B, Balaton AJ, Barnes DM, Anderson E, Bobrow LG, et al. Study of interlaboratory reliability and reproducibility of estrogen and progesterone receptor assays in Europe. Documentation of poor reliability and identification of insufficient microwave antigen retrieval time as a major contributory element of unreliable assays. Am J Clin Pathol 2001;115:44-58. Pileri SA, Roncador G, Ceccarelli C, Piccioli M, Briskomatis A, Sabattini E, et al. Antigen retrieval techniques in immunohistochemistry: Comparison of different methods. J Pathol 1997;183:116-23. Tafjord S, Bøhler PJ, Risberg B, Torlakovic E. Estrogen and progesterone hormone receptor status in breast carcinoma: Comparison of immunocytochemistry and immunohistochemistry. Diagn Cytopathol 2002;26:137-41. Löfgren L, Skoog L, von Schoultz E, Tani E, Isaksson E, Fernstad R, et al. Hormone receptor status in breast cancer: A comparison between surgical specimens and fine needle aspiration biopsies. Cytopathology 2003;14:136-42. Beatty BG, Bryant R, Wang W, Ashikaga T, Gibson PC, Leiman G, et al. HER-2/neu detection in fine-needle aspirates of breast cancer: Fluorescence in situ hybridization and immunocytochemical analysis. Am J Clin Pathol 2004;122:246-55. 2 Primary cytoreductive surgery and adjuvant hormonal monotherapy in women with advanced low-grade serous ovarian carcinoma: Reducing overtreatment without compromising survival?